© 2002 by Plant Health Progress. Accepted for publication 16 January 2002. Published 29 January 2002. Powelson, M. L., Ludy, R., Partipilo, H., Inglis, D. A., Gundersen, B., and Derie, M. Seed borne late blight of potato. Online. Plant Health Progress doi:10.1094/PHP-2002-0129-01-HM. Planting of potato seed pieces infected with Phytophthora infestans can lead to the introduction of late blight within a planting. When infected seed pieces are planted, there are three resulting scenarios: (i) a healthy plant emerges, (ii) no plant emerges because of the rapid decay of the seed piece, or (iii) a symptomatic plant emerges. A major factor favoring stand establishment and seed transmission is the severity of seed piece infection. When infection is severe, stand is compromised and transmission rate is low. When infection is mild, the plant emerges before the seed piece decays and, in some instances, the pathogen makes its way from the seed piece to the plant where a stem lesion is formed. Diseased seed tubers are the principle source of late blight inoculum for infection of healthy seed pieces. Treatment of infected or blighted seed tubers with a seed dressing with activity against P. infestans is not a viable tactic because the products are ineffective against established infections. Conversely, treatment of healthy seed pieces provides a high level of protection against late blight spores that are spread during the seed handling and planting operations. Optimum effectiveness is achieved when products are applied immediately following cutting, as none are effective against established infections. Seed treatment reduces the risk of seed transmission of late blight and enhances stand establishment and plant vigor. This tactic should be an important component of an integrated late blight management program. Programs to control sources of primary inoculum for late blight epidemics of potatoes caused by Phytophthora infestans have focused on destruction of cull piles and management of volunteer potatoes. Although seed tubers are generally accepted as the principle means by which the pathogen survives from season to season, their importance as a within-field source of inoculum for initiating late blight epidemics has often been underestimated. Within a seed lot, seed pieces will range from noninfected to mildly or severely diseased depending on the amount of inoculum distributed to the seed pieces and its ability to infect. For example, when a large amount of inoculum is deposited on the seed piece, the infection is severe and the seed piece rapidly succumbs to bacterial soft rot. These seed pieces are not regarded as an important within-field source of inoculum primarily because they decay before the sprout has a chance to emerge. On the other hand, a seed piece with a mild or latent infection will germinate and produce a small or normal-sized plant. Occasionally, but not commonly, the pathogen makes its way from the seed piece to the new shoot where the primary symptom is a stem lesion. Generally, the lesion extends from the seed piece to the above ground stem. In some instances, however, the above ground lesion is not continuous from the seed piece to the lower stem. Importantly, most diseased seed pieces do not result in emerging plants with symptoms of late blight. In fact, seed-to-plant transmission is a rare event. Soil moisture and temperature, cultivar susceptibility, physiological age of the seed lot, planting depth, and other factors probably play a key role in the development of infectious plants grown from seed pieces infected with P. infestans. Our research has focused on identifying those factors that favor seed transmission of P. infestans and compromise stand establishment. Seed piece treatment as a tactic for protecting seed pieces against spread of the pathogen during the seed handling operation also has been evaluated. These studies, done in Oregon and Washington, have included the two predominant genotypes of the late blight pathogen in the Pacific Northwest, US-8 (A2 mating type, metalaxyl-insensitive) and US-11 (A1 mating type, metalaxyl-insensitive). Fig. 1. Sporulation of Phytophthora infestans on cut surfaces of seed pieces. Blighted potato tubers were cut and incubated for 1 day (click image for larger view). Fig. 2. Transmission of late blight to an emerging sprout from a seed piece inoculated with sporangia of Phytophthora infestans (click image for larger view). Infection. Tubers can become infected with the late blight pathogen in the field during the growing season, at harvest, and during the seed handling operation. In the field, spores are washed by rain or irrigation water from blighted foliage into the soil where they may come in contact with and infect developing tubers. During the harvesting operation, spores are spread from diseased vines onto the tuber surface. With both scenarios, the number of spores landing on and infecting a tuber is quite variable. Some of the tubers will become severely diseased, some will slowly develop symptoms of blight, and some will be symptomless, whereas others will remain uninfected. The majority of severely blighted tubers are short lived because they rot very quickly from invasion by soft rot bacteria. In contrast, tubers with mild symptoms or latent infections seldom rot, or they do so slowly. 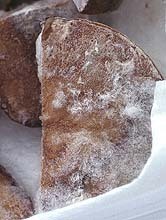 Diseased tubers that survive storage over winter are the principle source of inoculum for contamination and subsequent infection of healthy seed pieces. Infection of healthy seed pieces occurs from spores that are produced on both intact and cut surfaces of blighted tubers (Fig. 1). Research performed in Maine (10) has shown that on average, one sporulating seed piece can contaminate and subsequently infect three adjacent, healthy pieces. If the amount of inoculum deposited on healthy seed pieces is high, the resulting infection is severe. When these seed pieces are planted, few germinate because of their rapid decay by the secondary invaders, the soft rot bacteria. A mild infection results when seed pieces are infected with a small amount of inoculum (12). The fate of mildly infected seed pieces is two fold: (i) eyes do not germinate into sprouts because the rapid decay of the seed pieces, or (ii) plants emerge before the seed piece has a chance to decay completely. Some of these emerged plants will develop stem lesions of late blight (Fig. 2) within 2 to 5 weeks following emergence. In other plants, stem lesions will not appear until later in the season (2,7). Regardless of when in the season symptoms appear, these blighted plants serve as the springboard from which the pathogen is spread to the surrounding, healthy foliage. Transmission: Many factors probably influence the rate of seed-transmitted P. infestans. One factor is pathogen genotype. New immigrant genotypes of P. infestans, such as US-8 and US-11, are more aggressive on potato tubers than the previously established US-1 population (9) and have displaced US-1 throughout potato growing areas of the U.S. In a greenhouse study (11) in which transmission efficiency of US-1 and US-8 was compared, US-1 produced 1.9% diseased sprouts versus 19.4% with US-8. Another factor is the amount of inoculum (spores) spread to healthy seed pieces during the seed handling operation. In general, when seed pieces become contaminated with a large amount of inoculum, infection is severe (12), and the probability of seed-to-plant transmission is very low. With a low amount of inoculum, seed piece infection is mild, and the probability of seed-to-plant transmission is higher. As the sprout germinates, the pathogen grows into the stem from the seed piece as mycelium (1,2). When environmental conditions are favorable for disease expression, a lesion appears on the stem. Transmission was observed across a range of cultivars with US-8 in western Oregon and US-11 in western Washington at inoculum densities as low as 2.5, 25, or 250 spores per seed piece. Transmission frequencies of 0.53% in Oregon and 0.75% in Washington were recorded in 1999. In our 2000 studies, transmission rates averaged 2.78% and 1.01% for the respective locations. The time from onset of emergence until the appearance of stem lesions ranged from 1 to 35 days in Oregon and 9 to 18 days in western Washington. These observations are in agreement with studies in New York (3) in the early 1980s with the presumed US-1 genotype where late blight was first observed 17 to 46 days after emergence. We can estimate the risk of seed transmission from a given seed lot if the percentage of infected seed pieces is known. If 10% of the seed pieces are infected and we assume a seed transmission rate of 1.0%, the expected percentage of blighted seedlings would be 0.1%. At 40,000 plants/ha, there would be slightly less than 40 incidences of seed transmission/ha. If the seed transmission rate was 3.0%, the expected percentage of seedlings with late blight would be 120 incidences/ha. With both scenarios, these are relatively high rates of seed transmission in a commercial field, given the ability of this pathogen to rapidly spread from a single infectious plant. The total number of diseased plants from infected seed pieces in each field, however, is so low that the problem would likely go undetected prior to secondary spread of the pathogen. Stand Establishment: Stand establishment also is impacted by the number of spores on the seed piece. For example, with the cultivar Russet Burbank, as the number of spores per seed piece increased, the severity of seed infection increased. As a consequence, bacterial seed piece decay increased (Fig. 3) and percent emergence decreased (Fig. 4). In addition to a reduction in stand in Oregon with US-8, the onset of emergence was delayed 7 days at the two highest inoculum densities. Fig. 3. Effect of inoculum density of Phytophthora infestans on percent seed piece decay of potato cultivar Russet Burbank in Oregon and Washington. Seed pieces were inoculated with sporangia of US-8 in Oregon and US-11 in Washington (click image for larger view). Fig. 4. Effect of inoculum density of Phytophthora infestans on emergence of seed pieces of potato cultivar Russet Burbank in Oregon and Washington. Seed pieces were inoculated with sporangia of US-8 in Oregon and US-11 in Washington (click image for larger view). As with seed transmission, the amount of seed piece decay is mediated by soil environmental conditions. The ideal soil temperature for planting potatoes is 13 to 15.5°C (14). This temperature encourages quick emergence without promoting the growth of seed piece decay organisms. Noninoculated seed pieces of cultivar Russet Burbank achieved 95% emergence 18 and 29 days after planting in Oregon and Washington, respectively. At the two highest inoculum densities (250 or 2500 sporangia per seed piece), average emergence was 3.3 and 6.7% and 98.1 and 67.3% for US-8 in Oregon and US-11 in Washington, respectively (Fig. 4) and the percent seed piece decay for these inoculum densities was 99 and 99% in Oregon and 21 and 70% in Washington (Fig. 3). This suggests that either US-11 is a less aggressive pathogen of the seed piece than US-8 or the soil environment was less conducive for seed piece decay by the soft rot bacteria in Washington. Products. For management of seedborne diseases, seed treatment is often the simplest and least costly control measure available. Seed treatments are easily applied, and the treatments are inexpensive compared to foliar sprays. Furthermore, plant growth will be more vigorous, and the crop will produce a greater yield if the seed pieces are free of pathogens. If spread of late blight during the seed handling operation increases the risk for seed transmission, then application of a seed dressing is an obvious preventive approach to managing this phase of the disease. Our research has shown that a seed piece treatment is effective only when one or more of the components of the fungicide product has efficacy against P. infestans (6,13). At least four products containing one or two fungicides (maneb, mancozeb or cymoxanil plus mancozeb) with activity against P. infestans are registered. In addition to providing a chemical barrier around healthy seed pieces, seed treatment also reduces the number of spores produced on the cut surface of blighted seed pieces, thereby reducing the number of spores that can be spread during the seed handling operation. All four products were equally effective in maintaining seed piece health (Fig. 5A and B) and improving emergence (Fig. 6A and B). When a seed treatment was applied, few seed pieces decayed (2.4 and 5.6% in Oregon and Washington, respectively), and of those that did, a bacterial soft rot was the primary cause. Thus, a seed treatment protects against infection by P. infestans and prevents secondary invasion by the soft rot bacteria. Typically, products with maneb or mancozeb alone or mancozeb plus cymoxanil were equally effective in protecting against seedborne P. infestans. Regardless of product, final emergence approached 100% across a wide range of inoculum densities (Fig. 7). In contrast, products such as thiophanate-methyl or fludioxinil, which do not target P. infestans, do not enhance stand establishment in the presence of the late blight pathogen and may indirectly allow the transmission of the pathogen from the seed piece to the sprout (6). Fig. 5. Effect of potato seed piece treatment on the relationship between inoculum density of seedborne Phytophthora infestans and percent healthy seed pieces in (A) Oregon and (B) Washington. Seed pieces of cultivar Shepody were inoculated with sporangia of US-8 in Oregon and US-11 in Washington and immediately treated with the seed dressing (click image for larger view). Fig. 6. Effect of potato seed piece treatment on the relationship between inoculum density of seed borne Phytophthora infestans and final emergence in (A) Oregon and (B) Washington. Seed pieces of cultivar Shepody were inoculated with sporangia of US-8 in Oregon and US-11 in Washington and immediately treated with the seed dressing (click image for larger view). Fig. 7. Field view of trial on efficacy of seed piece treatments for control of seedborne late blight of potatoes (click image for larger view). Timing. The tried-and-true method of protecting seed pieces from disease is to “cut, treat, and plant”. The less time that elapses between cutting, treating and planting, the less the risk of disease spread. The risk and degree of secondary spread increases with the length of time cut seed pieces are held before treating according to research done in Maine (10). If no seed dressing is applied at the time of cutting and the seed pieces are held for several days, the contaminated seed pieces become infected and within days, abundant spores are produced on their cut surfaces (4). These spores are further dispersed during handling and planting (10). Such secondarily infected seed pieces are more likely to survive and produce infected stems than the original infected seed pieces, which frequently succumb to soft rot. We studied the efficacy of thiophanate methyl plus mancozeb (Tops MZ) applied at different times following cutting of seed tubers and inoculation of seed pieces with P. infestans on stand establishment. Tops MZ protected seed pieces against P. infestans when applied immediately following cutting and inoculation (Fig. 8A and B). Emergence approached 100% and seed piece decay averaged 1.3 and 1.6% in Oregon and Washington, respectively. When the seed treatment was delayed either 1 or 3 days, Tops MZ was no longer effective in improving emergence or maintaining seed health (Fig. 9A and B). Across a range of inoculum densities, percent seed piece decay averaged 90.7 and 92% in Oregon and 100 and 100% in Washington when the seed treatment was delayed 1.5 or 3.0 days, respectively. This is not unexpected because thiophanate methyl plus mancozeb has protective, but no curative properties. Fig. 8. Effect of timing of seed piece treatment on emergence of seed pieces 49 days after inoculation with Phytophthora infestans in (A) Oregon and (B) Washington. Seed pieces of potato cultivar Shepody were inoculated with sporangia of P. infestans genotype US-8 in Oregon and US-11 in Washington and then treated with thiophanate methyl + mancozeb (Tops MZ) immediately, 1.5 or 3 days after inoculation (click image for larger view). Fig. 9. Effect of timing of seed piece treatment on seed piece decay 49 days after inoculation with Phytophthora infestans in (A) Oregon and (B) Washington. Seed pieces of potato cultivar Shepody were inoculated with sporangia of P. infestans genotype US-8 in Oregon and US-11 in Washington and then treated with thiophanate methyl + mancozeb (Tops MZ) immediately, 1.5, or 3 days after inoculation (click image for larger view). Planting of pathogen-free seed is a critical component for management of late blight. Investigations of seed lots in Germany have shown that up to 20% of the tubers can be latently infected with P. infestans, even if no symptoms of tuber blight are evident (1). Therefore, a rapid and accurate method for specific detection of P. infestans in tubers prior to planting could help prevent introduction of infected seed pieces into the field. PCR primers have been developed by researchers at North Carolina State University (16) and at the USDA-ARS laboratory (15) at Fort Detrick, MD for the specific amplification of P. infestans in tuber tissue. The need for a rapid, sensitive assay for late blight in tubers based on more than visual observation or isolation of the pathogen has been indicated, as some states are considering tightening tolerances for late blight in seed potatoes. Until protocols for inspecting and sampling potato seed crops for late blight are developed, standardized, and accepted by the industry, the number one relationship that growers may want to cultivate is with the seed producers themselves. Dealing with reputable seed growers is probably the single best guarantee because these individuals usually have records of late blight occurrence in their seed fields. In the meantime the grower should check the seed tubers for symptoms of late blight prior to receiving delivery. Latent infections, however, will not be detected visually. Seed from cold storage often does not exhibit symptoms of late blight but if incubated at 20 to 22°C for 2 to 3 weeks, blight symptoms may develop. This approach allows for proactive management that targets the seed as the principle source of the inoculum. Environment is certainly central to the establishment of late blight in the field. Based on our experiments over the past several years, it is our hypothesis that soil environmental conditions that favor rapid seed germination also favor seed transmission of late blight; e.g., planting seed into warm, moist soils will increase the likelihood of transmission. Our work supports earlier observations by Hirst and Stedman (5) in England that warm, moist conditions favor the appearance of stem lesions. Conversely, soil conditions that favor rapid seed piece decay result in a reduction in stand, but less transmission of late blight. The disease forecasting system, Blightcast (8), has been used successfully to predict the appearance of late blight in potato plantings in central and eastern United States. Little information currently exists on soil environmental conditions that favor seed transmission, an area ripe for future investigation. Seed transmission rates do vary among cultivars. In the Pacific Northwest, the disease is usually first noted in the cultivars Russet Norkotah and Shepody, cultivars that are very susceptible to the foliar phase of the disease. In a study conducted in New York (3) on seed transmission with US-1, late blight usually, but not always, appeared in the susceptible cultivars before it appeared in the moderately resistant ones. Transmission frequency appears to be related more to susceptibility of the foliage than the susceptibility of the tuber. The release of cultivars with improved resistance to the foliar phase of the disease may translate into improved resistance to seed transmission. One of the most cost effective approaches for preventing the spread of the disease during the seed handling operation is to treat seed pieces immediately after cutting with a product that has activity against P. infestans. The value of this approach is twofold: (i) it protects seed pieces from spores that are spread during the seed handling operation, and (ii) it reduces the number of spores produced on the cut surface of blighted seed pieces. If application of a seed dressing is delayed following seed cutting, the opportunity for seed infection is increased. Products that are currently registered are not effective against these newly established infections because, for the most part, the fungicides lack curative activity. 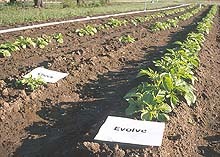 Currently, we are studying the efficacy of applying a fungicide with curative activity to the foliage at emergence. The objective of this tactic is to target the first cycle of disease that originates from seedborne inoculum. Because the appearance of stem lesions usually occurs between 10 and 40 days after planting, a curative fungicide is banded over the row within the first two weeks after 95% emergence followed by a second application 10 days to 2 weeks later. The coupling of a seed piece treatment with a foliar fungicide applied very early in the season is a two-prong approach for managing late blight that is introduced into a planting via seed. Research was supported, in part, by grants from the National Potato Council, the Oregon Potato Commission, the Washington State Potato Commission, Gustafson, Inc, and Syngenta. Technical paper 11858 of the Oregon Agricultural Experiment Station. 1. Appel, R., Adler, N., and Habermeyer, J. 2001. A method for the artificial inoculation of potato tubers with Phytophthora infestans and polymerase chain reaction assay of latently infected sprouts and stems. J. Phytopathology 149:287-292. 2. Deahl, K. D. 1995. Potato tuber’s role in the late blight complex. Pages 10-16 in: Proc. Natl. Potato Council Seed Sem. 14:10-16. 3. Doster, M. A., Sweigard, J. A., and Fry, W. E. 1989. The influence of host resistance and climate on the initial appearance of foliar late bight of potato from infected seed tubers. Am. Potato J. 66:227-233. 4. Dowley, L. J., and O’Sullivan, E. O. 1991. Sporulation of Phytophthora infestans (Mont.) de Bary on the surface of diseased potatoes and tuber-to-tuber spread of infection during handling. Potato Res. 34:295-296. 5. Hirst, J. M., and O. J. Stedman. 1960. The epidemiology of Phytophthora infestans. II. The source of inoculum. Ann. Appl. Biol 48:489-517. 6. Inglis, D. A., Powelson, M. L., and Dorrance, A. E. 1999. Effect of registered seed piece fungicides on tuber-borne Phytophthora infestans. Plant Dis. 83:229-234. 7. Keay, M. A. 1953. Delayed sporulation of Phytophthora infestans in infected potato shoots. Plant Path. 2:68-71. 8. Krause, R. A., Massie, L. B., and Hyre, R. A. 1975. Blightcast: A computerized forecast of potato late blight. Plant Dis. Rep. 59:95-98. 9. Lambert, D. H., and Currier, A. I. 1997. Differences in tuber rot development for North American clones of Phytophthora infestans. Am. Potato J. 74:39-43. 10. Lambert, D. H., Currier, A. I., and Olanya, M. 1998. Transmission of Phytophthora infestans in cut potato seed. Am. J. Potato Res. 75:257-263. 11. Marshall, K. D., and Stevenson, W. R. 1996. Transmission of Phytophthora infestans from infected seed potato tubers to developing sprouts. Am. Potato J. 73:370-371. 12. Platt, H. W., Peters, R. D., Mendina, M., and Arsenault, W. 1999. Impact of seed potatoes infected with Phytophthora infestans (US-1 or US-8 genotypes) on crop growth and disease risk. 1999. Am. J. Potato Res. 75:67-73f. 13. Powelson, M. L., and Inglis, D. A. 2000. Foliar fungicides as protective seed piece treatments for management of late blight of potatoes. Plant Dis. 83:265-268. 14. Secor, G. A., and Gudmestad, N. C. 1993. Handling and planting seed tubers. Pages 27-34 in: Potato Health Management. R. D. Rowe, ed. APS Press, St. Paul, MN. 15. Tooley, R. W., Carras, M. M., and Lambert, D. H. 1998. Application of a PCR-based test for detection of potato late blight and pink rot in tubers. Am. J. Potato Res. 75:187-194. 16. Trout, C. L., Ristaino, J. B., Madritch, M., and Wangsomboondee, T. 1997. Rapid detection of Phytophthora infestans in late bight-infected potato and tomato using PCR. Plant Dis. 81:1042-1048.